Freebie alert! 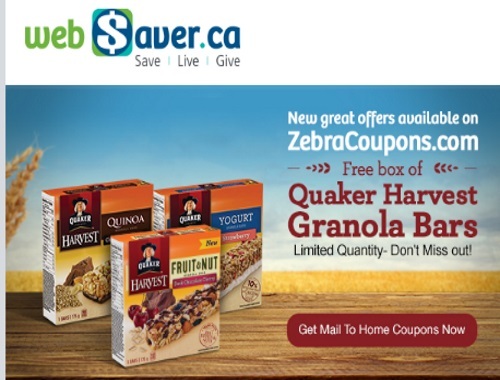 ZebraCoupons has a coupon for Free Quaker Harvest Granola bars ($12.29 value)! This applies on any flavour, 172-210g. This is Mail To Home Coupon, available in limited quantities. If you want a Free shipping code for ZebraCoupons, please join our private Facebook Group here and write a comment on this post requesting one. Or if you already got a code from me you can use it on this coupon! With the Free promo code you can order a free coupon envelope with no shipping cost (normally $2) and you can choose this coupon, as well as any of the others that ZebraCoupons currently offers. Codes are available while quantities list, we only have a limited number. Update - We're out of Free promo codes now, if we get any more you will be the first to know because you are a member of our Facebook group. Request sent for private Facebook group!! Would love a promo code! !